Paul Phua topped a field of 13 entries to win the 2016 One Drop Extravaganza €100,000 buy-in super high roller no-limit hold’em event for €752,700 ($827,722 USD) and 600 Card Player Player of the Year points. With the small turnout for this last-chance event held at the Casino de Monte-Carlo only the top two players made the money. Talal Shakerchi, who won the 2016 PokerStars Spring Championship of Online Poker main event for $1.4 million, was eliminated on the money bubble. Shakerchi was left with less than a big blind after running A K into Phua’s A A . The very next hand he was eliminated, setting up a heads-up showdown between Phua and Mikita Badziakouski. Heads-up play began with Phua holding roughly a 4-to-1 chip advantage over Badziakouski. On the final hand Badziakouski moved all-in from the button for around 800,000 of the 2.6 million chips in play. Phua made the call and the two revealed their hands. 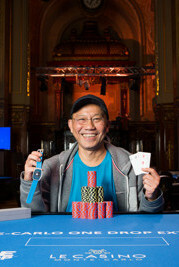 The board ran out A 8 4 A Q and Phua’s pocket pair held up, securing the pot and the title. Badziakouski was sent to the rail as the runner up, earning €501,800. This was the largest cash of the Belarusian’s career.